Ahna Cleveland has an extensive background in business, teaching, wellness and movement therapy. She holds a Bachelor of Science degree from the University of Wisconsin and a Masters degree from Sarah Lawrence College, New York. 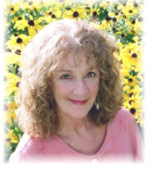 She has taught stress reduction, relaxation and visualization techniques both privately and in hospital, business, sports medicine and chemical dependency recovery settings. In addition, she has set up and taught fitness and wellness programs both onsite and offsite for Bay Area companies such as Bank of America, Union Bank and Dean, Witter & Associates. As a successful entrepreneur, she has 19 years experience in sales and marketing; having owned showrooms in San Francisco and working with clients such as Nordstrom, Macy's and other major retailers. Lifelong studies in fitness, nutrition, psychology and healing techniques brought her to the creation of "Opening Energy", which is designed to help anyone, anywhere reduce stress and create more energy and focus; with the goal of leading a richer and more fulfilling life. In addition to her work with Opening Energy, Ahna is an inspiring and award winning speaker and trainer on a variety of topics including creativity, wellness, prosperity and business. She has been an Area Governor for Toastmasters International. Ahna is currently Director of the Business Women's Network in Boulder, Colorado.